My first sermon was epic. And when I say "epic," what I really mean is "not epic," but I like to pretend--especially in this moment--that it was epic in the regular sense of the word. I actually cannot for the life of me remember what I preached. I didn't write it down anywhere, and there are no recordings that exist of the event. There was a video recording, however, which shall factor into this story momentarily, but that, too, went the way of the dodo at some point. A fact that I do not lament in the least. When I preached the aforementioned sermon I was filling the pulpit after the departure of my pastor and mentor, who had served the church for 17 years, three of which I was privileged to experience. He was a kind and intelligent man, who could read in German, Greek probably Hebrew and of course had a command of English that was fairly impressive. He read his sermons from a manuscript, though, anchored behind the pulpit---a custom that I had never seen before until I became a member of a mainline Protestant church. The pastors of my youth preached with an outline at most and could breathe fire and brimstone for forty-five minutes or more off the top of their heads. So when I took the pulpit for the first time, I had an outline, but I had fairly memorized everything I was going to say, and planned on walking around in front of the pulpit rather than staying behind it. In order to do this, however, I had to use the ancient lavaliere mic the church owned, which had a freakishly long cord that plugged into an outlet on the floor of the chancel. As you walked around with this lavaliere, you had to constantly whip it out of the way or you might very well end up on your face. You might see where this is going. At the conclusion of my sermon, I stuck the landing, ended with a flourish, nailed the last line, and concluded as dramatically as I could---just knowing that I had left the congregation of maybe 70 people as breathless as if they had seen the ghost of Jonathan Edwards appear and deliver "Sinners In The Hands of An Angry God" in a voice that sounded like thunder. I turned to walk the roughly twenty feet back to the chair where the pastor usually sat enthroned by the choir loft, smug in my ability to wow the congregation with my rhetorical gymnastics. And my feet got tangled in the freakishly long lavaliere cord and I tripped. The video that I viewed after the fact showed me actually fling my hands in the air and do a brisk little jig as I tried to keep my balance. From the congregation it would have looked as though I were jumping slightly into the air with joy, or channeling Richard Simmons. It was an unmanly moment---the evidence of which is thankfully now lost forever. Most first sermons are pretty bad. But Jesus' first sermon was probably the worst first sermon ever. Because it almost got him killed. 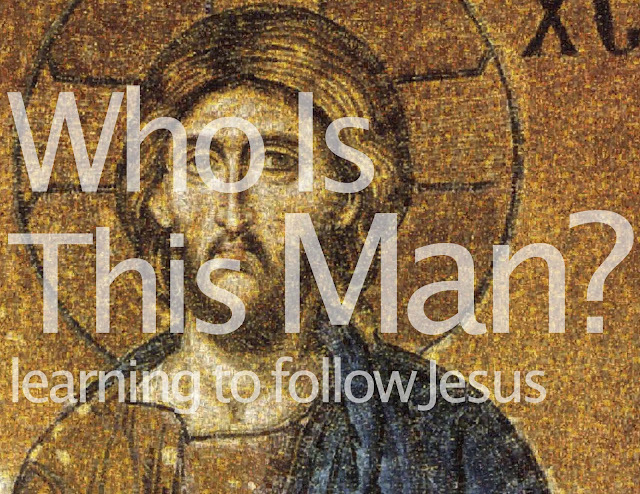 For the next two weeks I am going to be preaching about this first sermon of Jesus in a little series inside the series that we've entitled "Who Is This Man?" We're going to begin by hearing the sermon itself and learning about the setting within which Jesus preached it. Okay, you have to wait a minute to hear what was written. I want to show you a photo inside a replica of a first century synagogue. This replica is actually in Nazareth, which makes it cool. The people gathered for worship in the synagogue would have been seated on the steps you see agains the wall. 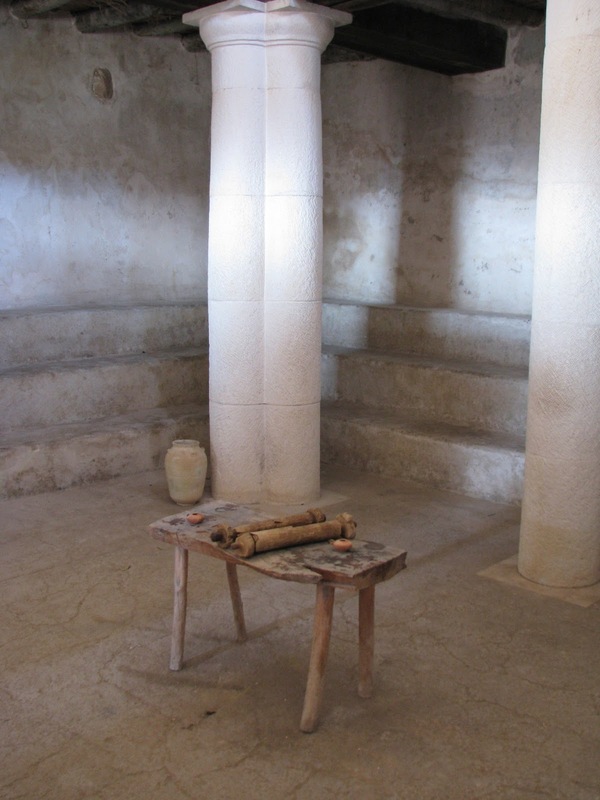 Jesus would have stepped forward and stood near a table, similar to the one standing here, and he would have read from a scroll that could have looked like the one on the table in the photo. Let's see... debts, freedom, redemption... sound familiar? Luke is echoing Isaiah's words here and he indicates that Jesus made a pretty bold statement to a bunch of people that he'd grown up with, and who he knew were focused on religious practices, keeping the law, trying to live rightly. This Scripture and his declaration that it's prophecy had been fulfilled put Jesus in a tough spot. He's essentially saying, "It's not about religion, it's about a relationship. It's not about ceremonies it's about transformation." Here's the thing... This story tells us who Jesus is. It's his purpose statement. Did you know that "The Purpose Driven Life" by Pastor Rick Warren is the single best selling book of all time except for the Bible. It's being rereleased in a new format, geared toward a new generation of readers even as we speak. Yet, despite all of it's talk of purpose and how to find it, not once does "The Purpose Driven Life" include Jesus' own purpose statement. In fact, most books about purposeful Christian living don't. And the reason they don't is because it is hard to hold on to and feel warm and fuzzy about what Jesus is saying. I mean the first words out of his mouth when he read the scroll are, "The Spirit of the Lord is upon me!" How many of us can truly say that? In church world we really miss this one. We have buildings, budgets, staff and members of our churches... but do we have the Holy Spirit? The question is not "How is our church doing?" but "What are we doing as a church for God?" At my church we say that we "Know Jesus and Show Jesus," but do we really know him? Do we really understand his purpose statement? Maybe it's too hard for us to own. Maybe it's too difficult for us to put our minds and our hearts around. You see when Jesus was tempted in the wilderness by the Devil for forty days and forty nights, he not only didn't give in to the temptation, but emerged from that wilderness moment full of the Holy Spirit and ready to charge Hell with a squirt gun. Jesus said no to the false options of the Devil, but he said yes to a mission that was given to him by God: The mission that he outlines here in Luke 4:17-21. So how can we get this---I mean really get this in such a way that we don't lose it at the first sign of a challenge? Here's how it works for you and me. We demonstrate our knowledge of Jesus when we do what he came to do---when we KNOW him and SHOW him. And what does this look like? It looks like seeking the lost---those who are far from God, or who don't know God at all. It looks like working to set captives free---people who are trapped in addiction, the cycle of poverty. It looks like giving sight to the blind---people who are religious but who have no relationship. It looks like bringing good news to the poor---those on the margins, the forgotten, the least of these. Jesus speaks this urgently, too, which can't be ignored. "Today," he declares to the crowd in the synagogue, "this scripture has been fulfilled." This is no wait and see moment. This is no "let's convene a committee meeting" moment. This is no "let me wait until I get things figured out" moment. Jesus means TODAY. If you are a follower of Christ, you are called to live this way. To do these very things that are at the heart of what it means to be a Christian. This is the purpose of Jesus life and ministry. The purpose of his death and resurrection. Child of God, live this day as if it were your first day, as if it were your last day, as if it were your only day. Live this day in the purpose of Christ.